There are plenty of articles around the Internet discussing how to enable or disable a Wi-Fi adapter based on the status of the wired connection. Whilst I’ve seen that some Dell laptops have this as a simple option in BIOS, our Lenovo machines do not, so this post describes how I achieved a workable solution. This means that it’s possible to create a scheduled task with triggers to look for those specific events, and run a script to enable or disable the wireless adapter. Note that the script may not work out-of-the-box if you don’t have a NIC that’s driven by one of the above drivers. I currently push the script and the scheduled task configuration out using Group Policy Preferences. Note that this script depends on the network adapters having their default names as per Windows 8.x’s naming. Also, PowerShell 4.0 is required, as the script makes use of the newer *-NetAdapter cmdlets. ← PowerShell: Disable all Outlook add-ins except for a specific list. How do i identify event id for cellular in windows 10 if it goes down or up ? and is there any ways to switch to WIFI whenever my Cellular goes down ? It really depends on the hardware and drivers in use. Perhaps the cellular adapter doesn’t log any information. 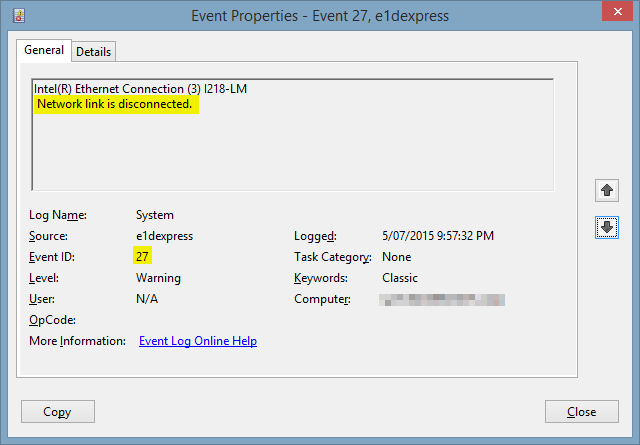 Or, you may need to enable a specific event log that’s disabled by default.